This iPong Table Tennis Training Robot is your ping pong practice partner. 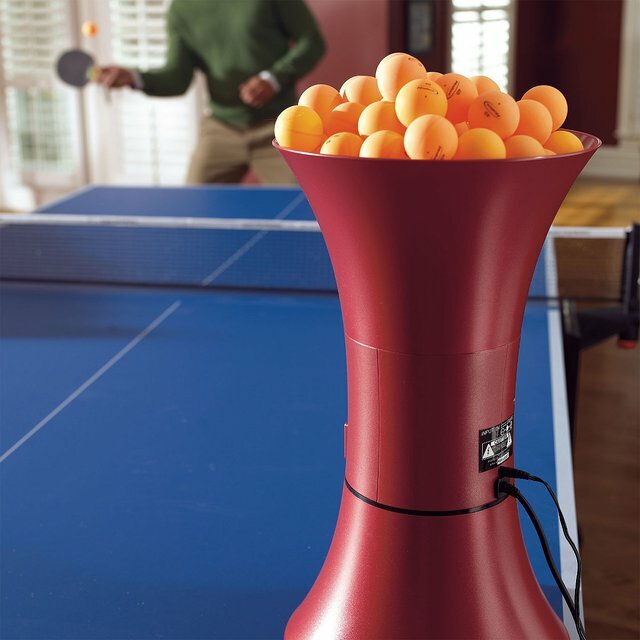 The robot holds over 100 ping pong balls and can serve them to you at your desired intervals. Use the included remote to adjust power, frequency, and spin. Practice returning a variety of backspin and topspin serves to improve your table tennis game. Challenge yourself by increasing the frequency of balls per minute from casual to blazing fast as you improve. The included one year limited manufacturers warranty provides coverage for any problems. The Table Tennis Practice Partner measures 11 inches diameter by 19.5 inches high. The iPong robots weighs 5 pounds. The product kit includes a 10 foot wired remote and AC powered adapter.